I love building terrain. Be it turning junk into an orkish fortification or assembling an official kit to create an industrial complex of catwalks and boilers. While I have plenty of unpainted miniatures laying around (who doesn’t) lately I’ve been focusing almost entirely on crafting terrain. Which has led to the strange predicament of running out of things to work on. 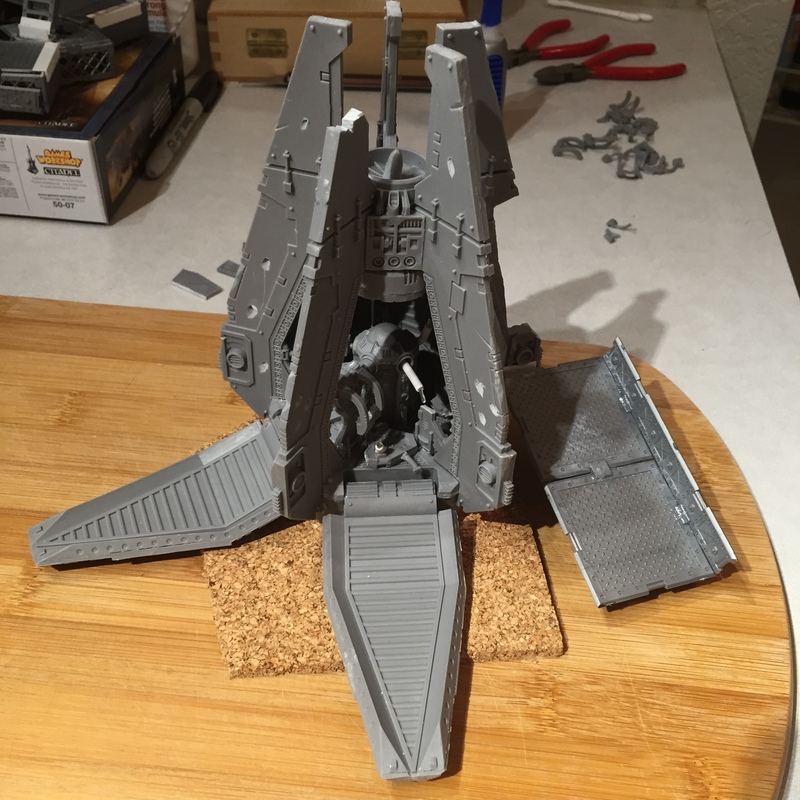 Thankfully, I have friends with their own piles of plastic and so a friend offered to let me build some for him. 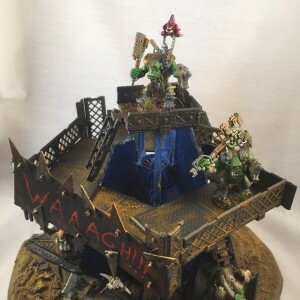 Last week I discussed the construction process on my Waaagh!!! Tower. 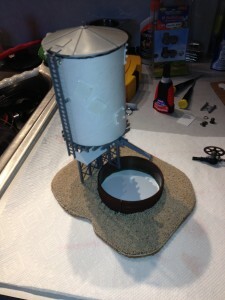 With the basic construction completed, I wasted little time moving on to paint. 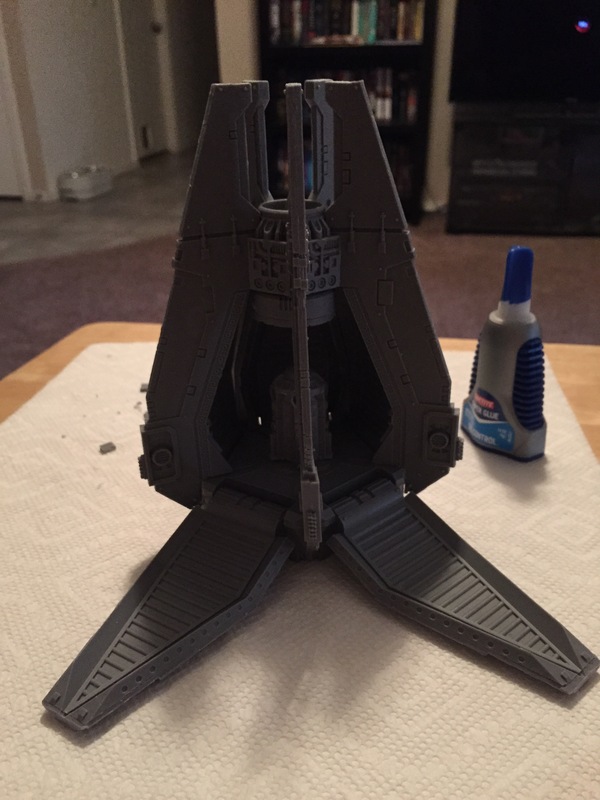 I left it separated into the three main components of base, drop pod, and upper walkway so I could prime them separately with their base colors. Now some people like to hand paint primer, others like an airbrush. I rather like Rust-Oleum’s Painter’s Touch spray primer for the purpose. It is thick enough for good even coverage but thin enough that it does not obscure details. As an added plus it comes in dozens of different colors and sheens. 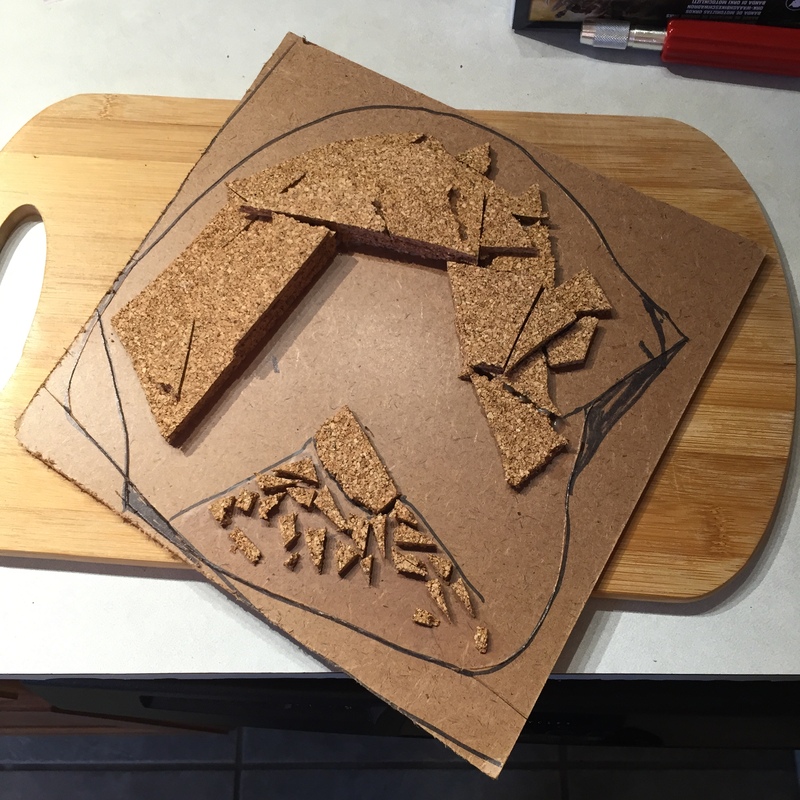 For this project, I used Satin Nutmeg for the base. 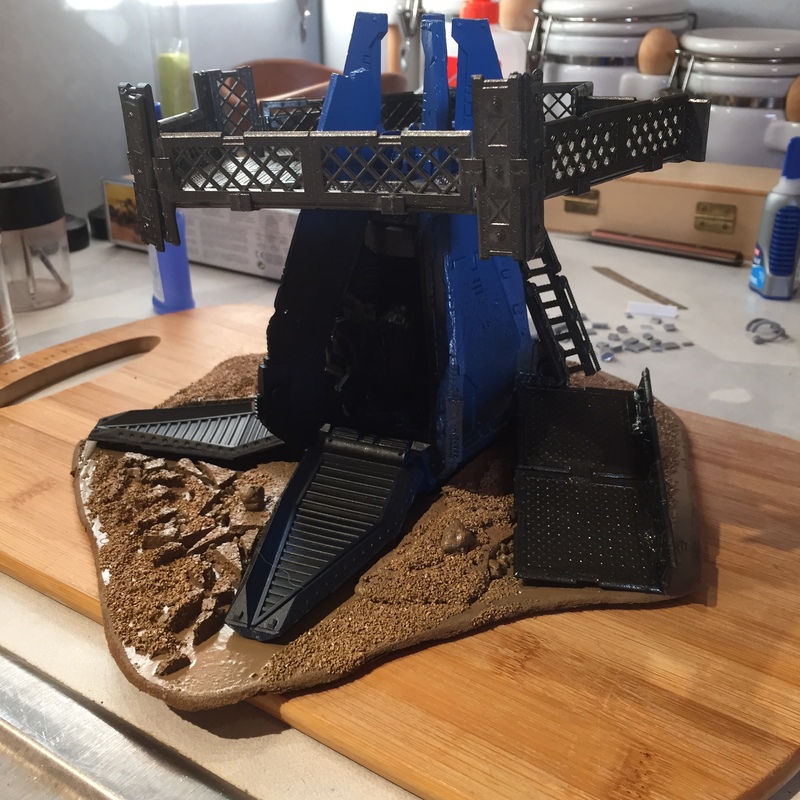 While the tower got a coating of Glossy Deep Blue with a blast of Flat Canyon Black for the interior and area right around the open doors to create a burnt out effect. The walkway I primed with a Flat Gray and then dry brushed with Pig Iron from the P3 line of model paints. Once the three components were all dry I started the detailing process. 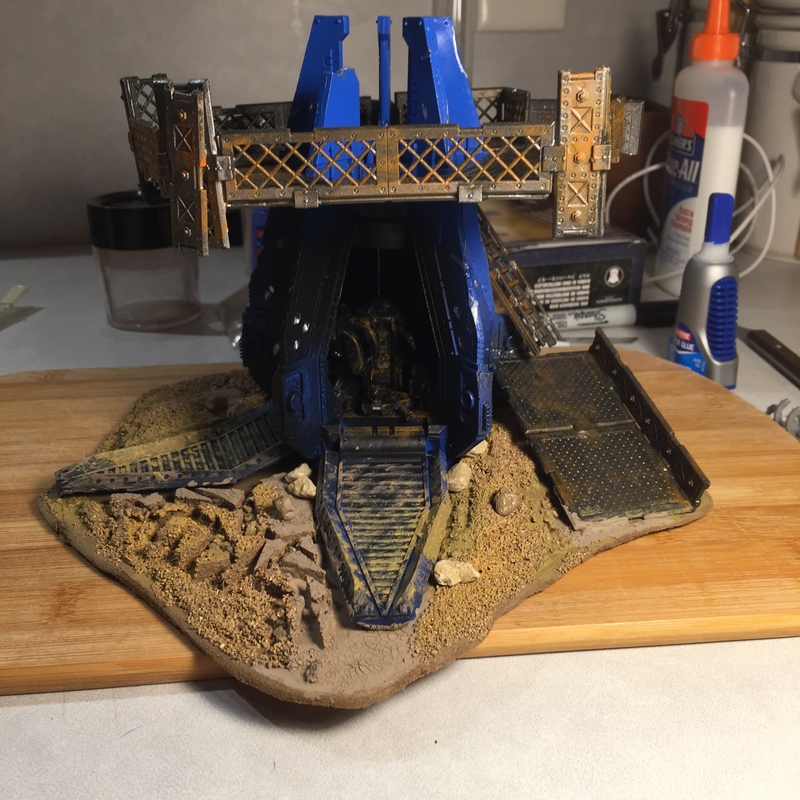 All around the base, I used a mix of Citadel’s Armageddon Dust, Agrellan Earth, and P3’s Beast Hide and Rucksack Tan to create a variety of extra texture effects and variations in the color of the rocks and dirt. I also used the Rucksack Tan to give the effect of dust going over the open Drop Pod doors along with a thin wash of Seraphim Sepia. The Drop Pod itself I hit with P3’s Quick Silver on all the holes, pits, and various marks I had carved into it. I also dry brushed the same color along any sharp edges. Then I hit all of the same areas with a light dry brushing of Citadel’s Ryza Rust and washed the entire thing in Nul Oil. The interior got a light dry brushing of Pig Iron and then Ryza Rust before also getting a wash.
With the base and the Pod done, I started on the walkway portion. This was the simplest part; I just hit everything with a dry brush of Ryza Rust and then a wash of the Nul Oil. You may have also noticed that the Tower got two extra parts since my build post. As I was painting it there seemed like something was missing, the metal Waaagh!!! Banner was a no brainer, but even with it, the tower felt like it needed a topper. Enter an extra crow’s nest mounted top. I really think it pulls the whole project together. 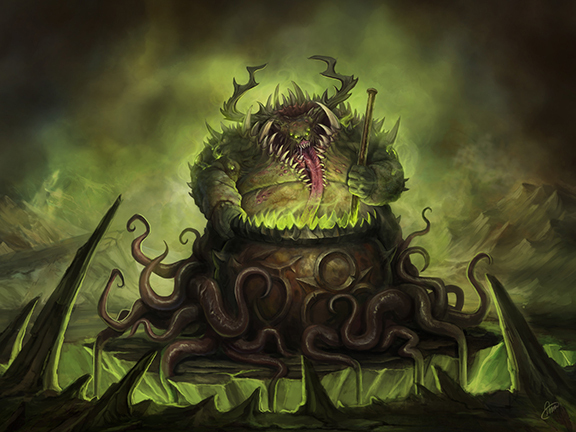 To close this post out, a few images of the tower with its Green skinned builders. 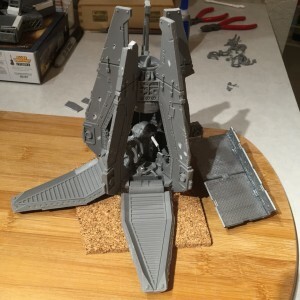 The venerable Drop Pod is an iconic part of the 40k landscape. Slamming into the battlefield, unloading squads of space marines ready to destroy the xeno threat. I assume that after a victory a great ship comes in to scoop them up, clean them up, and ready them for further deployment. But what about when the marines fail, what happens to all those Drop Pods when the battle has been lost. With my great Road Waaagh!!! 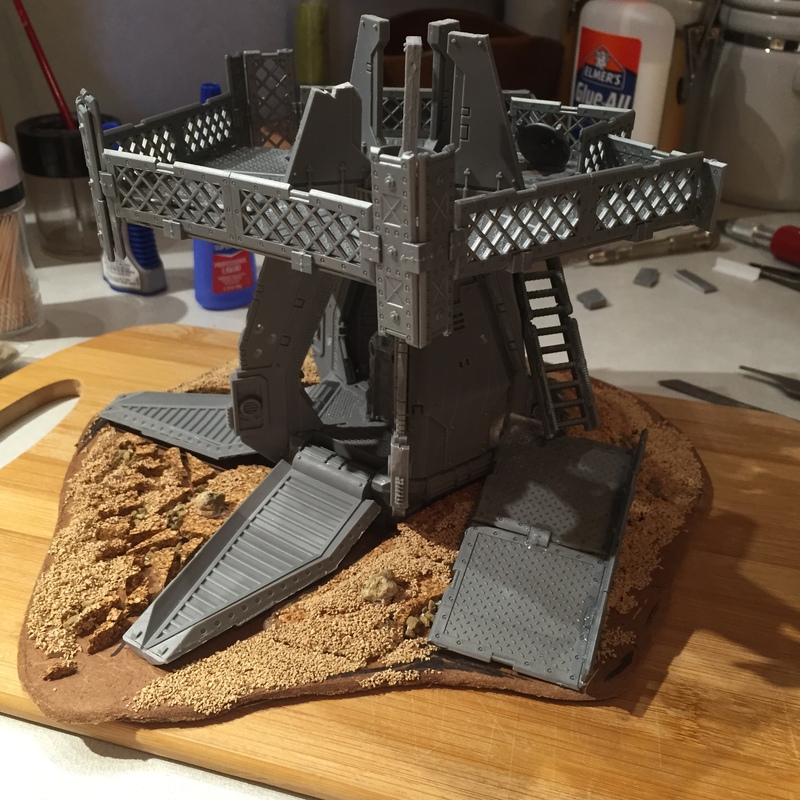 nearly complete, I’ve started turning my attention towards building some terrain to give the battlefield as much character as the models playing across it. 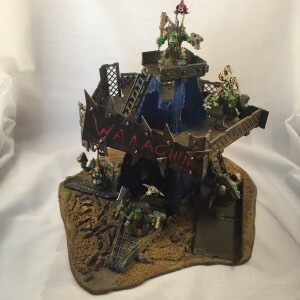 Having enjoyed the Dawn of War games I decided a Waaagh!!! Tower would be a nice place to start. 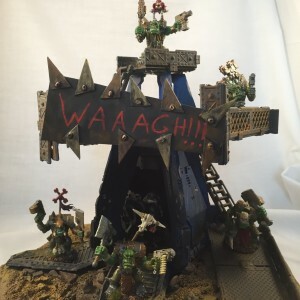 Being that Orks are scavengers, a Drop Pod seemed like a perfect starting point. The kit I used is actually a resin recast. 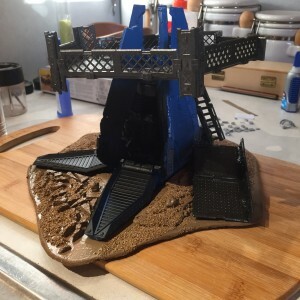 I went that direction partly because using an actual kit seemed a little pricy for this purpose, and partly because the recast was already pitted and damaged which aided my purposes. Of course I went back at it with a drill and xacto knife to give it plenty of battle damage. Once it was assembled, I started adding pieces from the Syberclicks set I reviewed last week to build up the portions I imagined Orks would have built up around the ruined pod. As I mentioned in that review the pieces in the kit look great, but the clips used to keep it all together left a lot to be desired. For this project I used tried and true superglue, and layered the panels to look like they had been peicemealed together. I also went with a variety of different sized panels for the railings to maximize the rambshackle thrown together look. 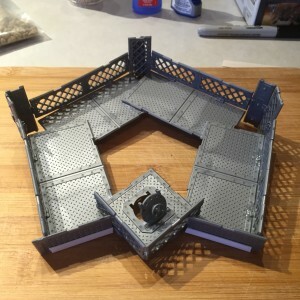 For a base I started with a piece of ten by ten HDF board, it gives a nice sturdy foundation. 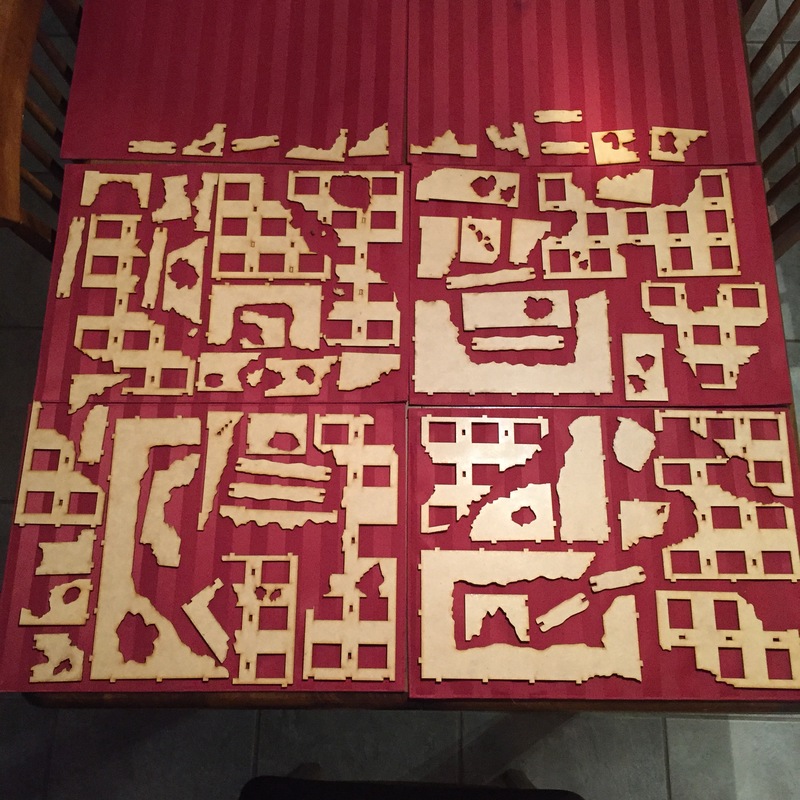 Then once I had a template for the drop pod traced, I started layering cork board. I wanted to give the look of cracked earth from the Drop Pod initially hitting the battlefield. 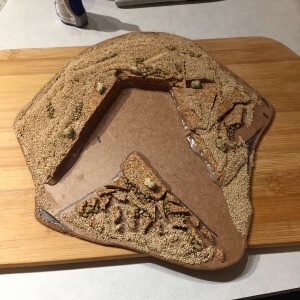 Hot glue was used to round out some of the edges, and then I hit everything with a sander to smooth things a bit before putting down several layer of different sized sand and gravel. With all of the construction complete I had a pretty decent looking tower. I’ll cover painting it up next time. I am in the middle of another project but I really wanted to keep my one post a week schedule going, so I thought I would give you all a glimpse at an older project of mine. Before I dove into the world of Orks and 40k, I tested the war game waters with Warmachine. Along with my first miniature painting work, this period also saw my first efforts at a terrain project. 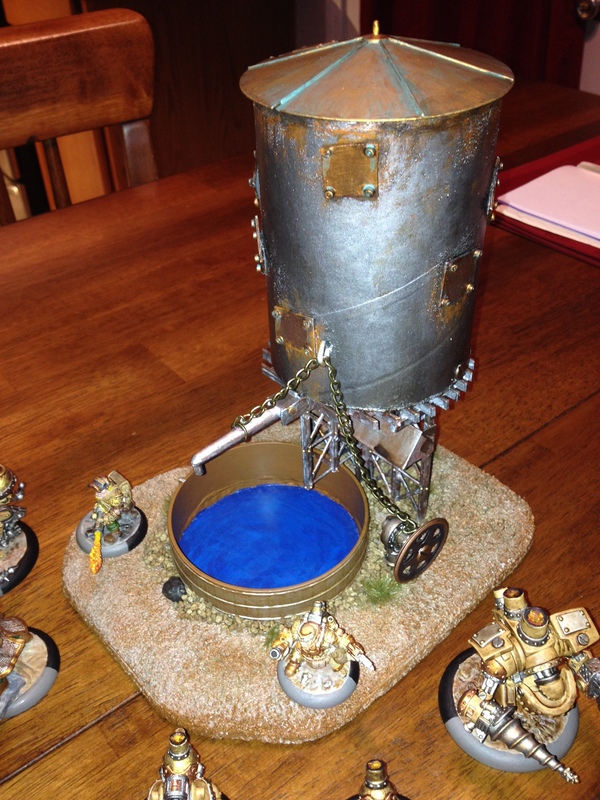 Since Warmachine tends to only need a handful of dice, I decided to incorporate a dice tower into its construction. The basic build consisted of a poster tube and parts from a Bachmann Trains O scale water tower kit. 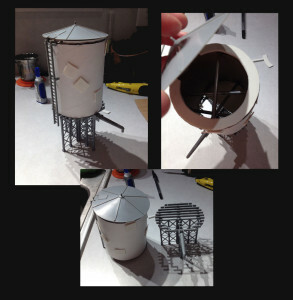 Detail elements and the dice tower internals came from plasticard and parts from my bits bin. 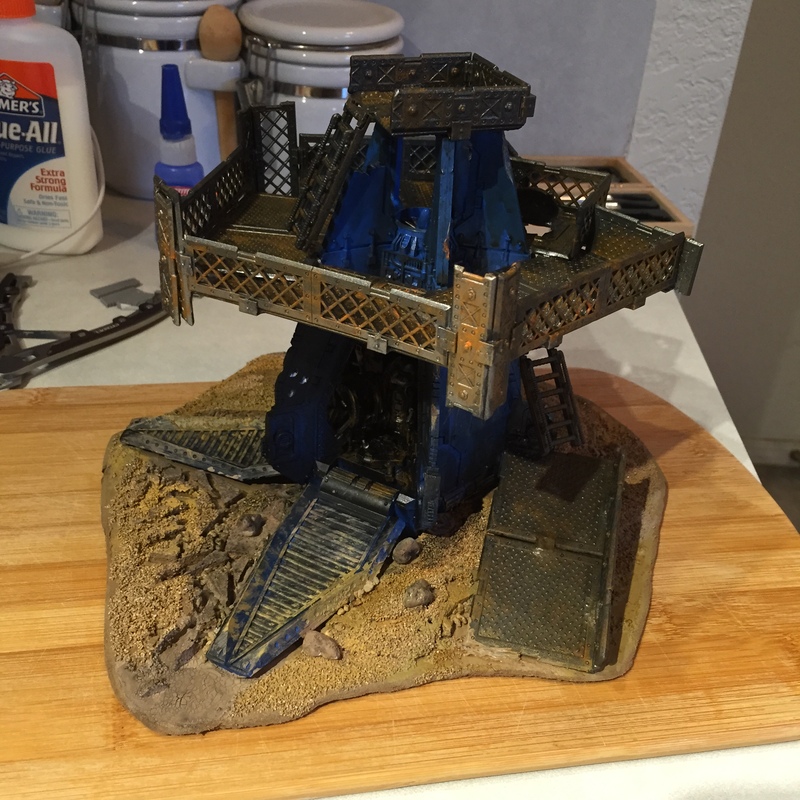 The final element of any good terrain piece is the base and I built this one before I had really started playing with HDF board. As a result, it is just two layers of corkboard with a piece of plasticard sandwiched between them for structural integrity. This was also necessary to create a watertight seal for another special feature I wanted to try. Inside the water trough/dice catch, I decided to try out water effects for the first time. 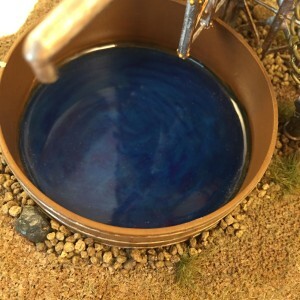 I went with Woodland Scenics Realistic Water because the reviews pointed towards it creating a very durable surface. I found it to be an easy to use product; you lay down thin 1/8 inch layers of clear resin and give each one roughly 24 hours to cure. I painted the base a light blue to start with and then put down thin streaks of blue ink between layers to give the water a sense of depth and motion. Once I was ready to start the actual painting process, I started with a variety of basic browns and metallics from P3 paints. 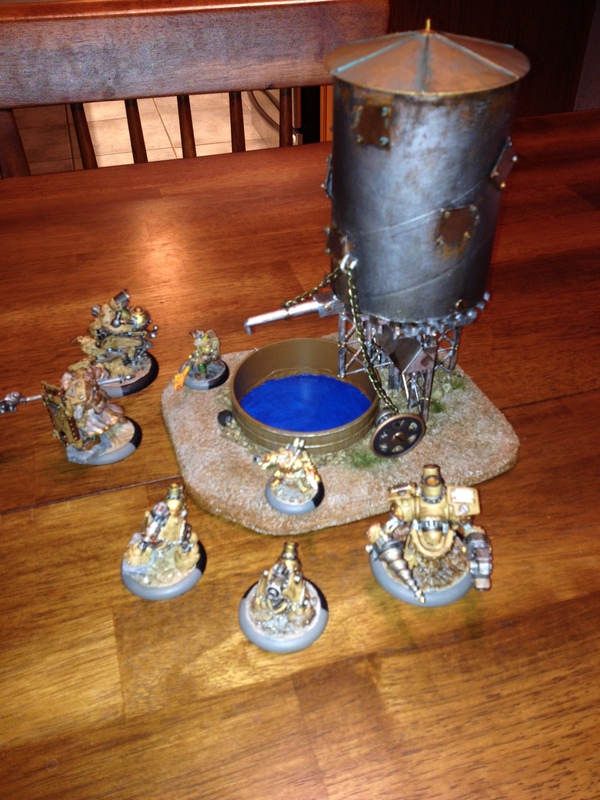 This was also the first project on which I experimented with Citadel’s technical line. In particular, I used Ryza Rust, Typhus Corrosion, and Nihilakh Oxide all too excellent effect in giving the tower a weathered and worn look. I was especially proud of the oxidized effect on the bronze roof. There was a lot of experimentation involved on this project and I learned a lot from it. Never be afraid to try new techniques. 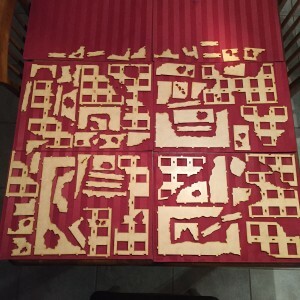 I recently picked up the Pegasus Hobbies Syberclicks modular terrain kit to use in a project. 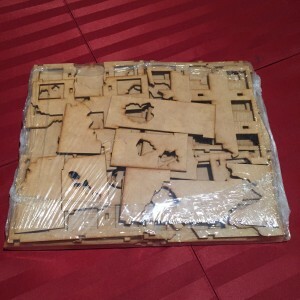 It’s an interesting kit designed to allow you to build a variety scifi style buildings using snap together construction. Theoretically, that should result in a versatile set of parts that you can quickly build terrain with, and change the designs anytime you like. In practice, it does not work quite as well as advertised. 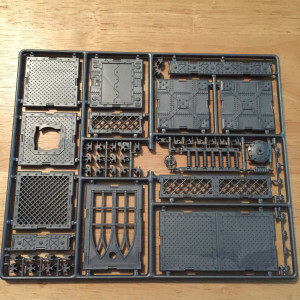 The set consists of six identical sprues of molded metallic grey plastic. The set consists of a variety of steel panels, grates, ladders, hatches, and some gothic windows. 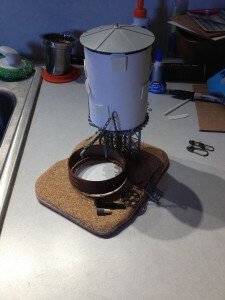 Everything is laid out so all the parts can be clipped and assembled with minimal cleanup. There are very few mold lines and the parts all have excellent details. 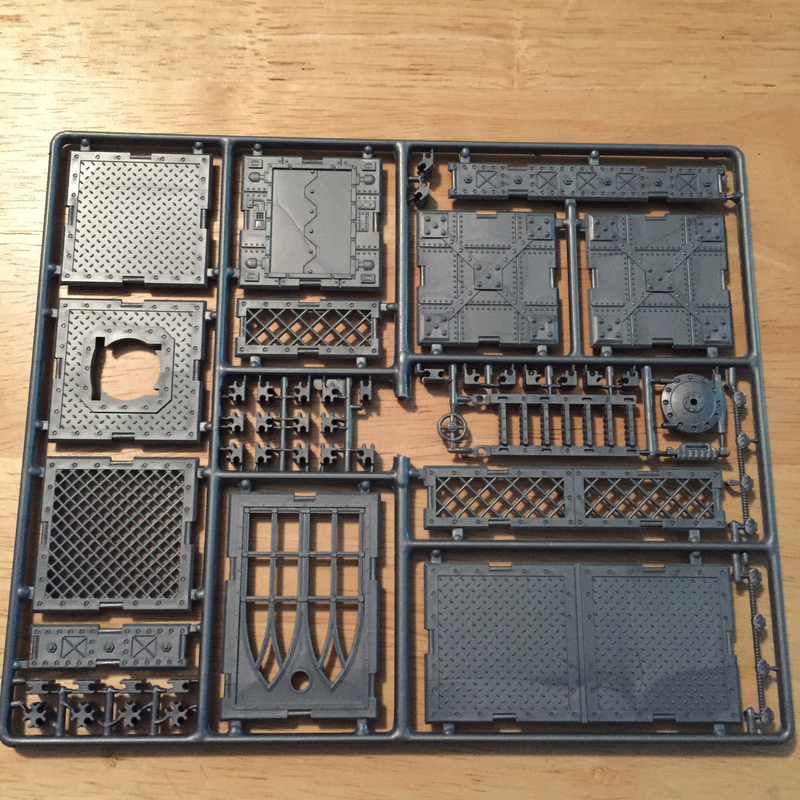 Everything feels solid and looks great on the sprue.